The Express didn't think its readers would be particularly interested in the trial and restricted front-page coverage to a puff. Was it loyalty to Cameron or news judgment that made it choose Brooks and Murdoch as the subject matter, rather than Coulson? Whichever, it was probably a good decision, given that Coulson won't be as familiar to its readers as the other two. 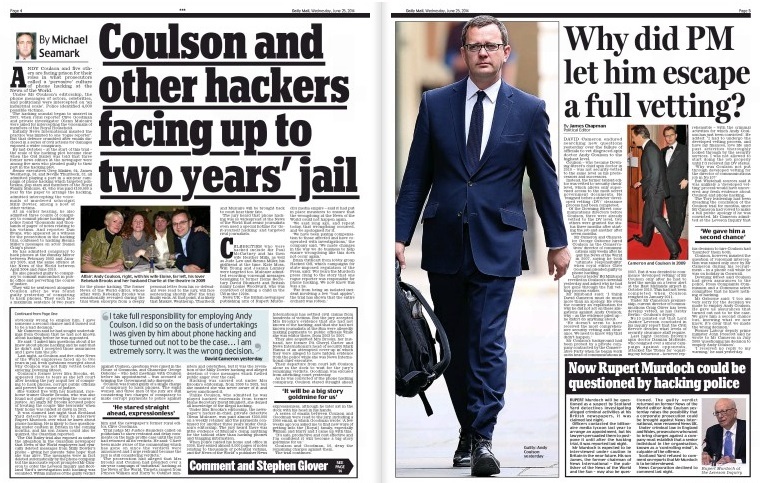 The Mail went all out at Cameron with its heading, which would have been fine if it had made the two pictures bigger and reduced that indigestible secondary headline that tries to get too much in. Or even put a picture of Cameron in the middle. The text focused squarely on the Prime Minister and politics, apart from mentioning the Brooks acquittal in the second par. 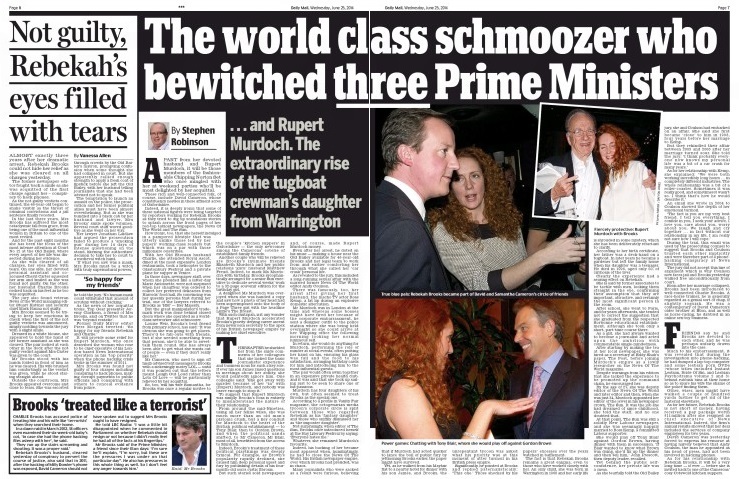 The Mail splash turns to the first of three spreads, pages 4-5. The left-hand page lead is a straight up-and-down report on the conviction, the other guilty pleas and some background on the hacking allegations. It also includes News UK's statement. The question of the security vetting of Coulson on his appointment is a more interesting read. He was initially checked by a private company, but was going through the more robust "developed vetting" to which his predecessors and successor were subjected, when he resigned in January 2011. It would have been good to have been told what developed vetting involved. The second spread is given over entirely to Rebekah and Charlie Brooks. The account of the defendants' reaction to the verdicts is pretty vacuous, while the profile of Mrs B is bitchy and patronising. How ironic, too, that she herself indulged in a pampered lifestyle that was utterly unlike those led by her papers’ working-class readers but which was on a par with those millionaire celebrities. With her Old Etonian husband Charlie, she attended Royal Ascot, dined at the most expensive London restaurants, took a helicopter to the Glastonbury Festival and a private plane for supper in Venice. The Mail shows its true colours on the final spread, with its emphasis on five stars who manipulated the Press, rather on the people who suffered from having their phone messages intercepted. This was a panel story in the Times, which was the right treatment - deserving of mention, but not the main event. The "best" anecdote from a hacked celebrity was Abi Titmuss's story about how she couldn't access her voicemail because a hacker was on the line at the same time. That doesn't get a mention here, and David Blunkett's distress is given short shrift. 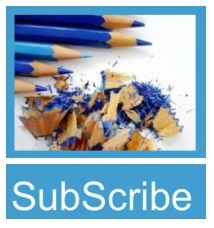 There is plenty of room, however, for an attack on the Guardian regarding the deletion of Milly Dowler's voicemails. It is hard to emphasise this strongly enough: the volcano didn't erupt and the News of the World close because the messages were erased, but because a private investigator had intercepted her phone at the behest of a journalist. 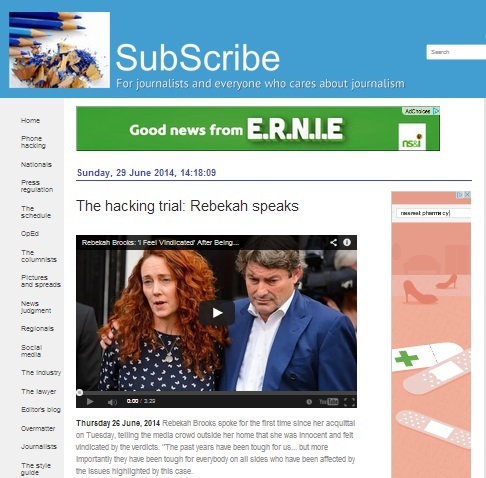 "But the journalists at the News of the World then encountered a problem. Milly's voicemail box filled up and would accept no more messages. Apparently thirsty for more information from more voicemails, the paper intervened – and deleted the messages that had been left in the first few days after her disappearance." But the upshot would have been the same without this inaccuracy. The reaction to the interference in a murder inquiry would have been almost as strong - and Murdoch had it in mind to close the News of the World anyway. This just made him move earlier. 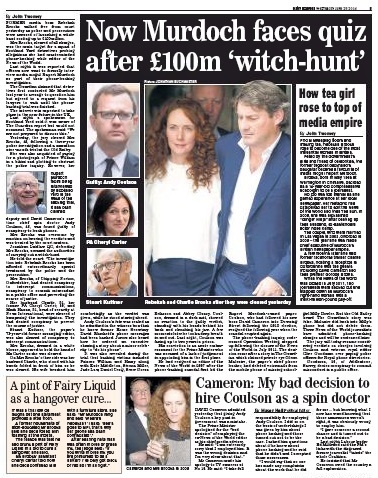 The Express confined its coverage to page 5, using the "witch-hunt" line from Rebekah Brooks's QC Jonathan Laidlaw, and offering no provenance for the £100m figure. Apart from that, the copy is straight as straight, the Brooks profile perfunctory and Cameron underplayed. 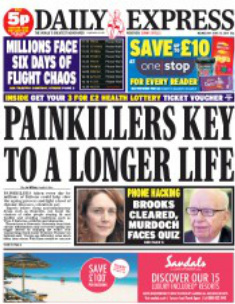 Given the space constraints, the Express has probably covered the main points, but there's a lot missing and the story really required at least a spread in a paper aiming at the middle market. It wouldn't have hurt to have moved the Albanians and Iraq stories from page 4. To page 7, perhaps? The world would probably not have noticed the absence of the tale of people whose homes overlook a waste tip. Some will say that the Tory leader was merely recognising the realities of media power. The trouble was that the price which was paid was the employment of a man who wise heads in Fleet Street and the Conservative Party had urged him to avoid. Nonetheless, Mr Cameron went ahead, naively taking Mr Coulson’s false assurances on trust. So fixated was he by the hope of Mr Murdoch’s endorsement that he threw all caution to the wind, and made almost certainly the most foolish decision of his political career. The Mail has often asked why the police thought it necessary to launch melodramatic dawn raids on journalists’ homes, rampaging from room to room and rifling through family possessions. After all, they knew they weren’t dealing with terrorists, gangland killers or armed robbers...Isn’t the 6am knock on a journalist’s door the mark of a totalitarian state? But it is David Cameron’s poor judgment that concerns us even more. For on his own admission, yesterday’s guilty verdict reflects appallingly on his decision to hire the former editor of the News of the World as his director of communications. So why did Mr Cameron ignore wiser counsels? Two reasons – neither worthy of him. But just as damning of Mr Cameron’s judgment are those verdicts of not guilty...for don’t these expose the baselessness of his decision to call the Leveson Inquiry in his panic-stricken bid to distance himself from the Murdoch papers he had so assiduously courted? To save his own face, Mr Cameron was prepared to jeopardise our 300 years of Press freedom from State interference. After the imprisonment of three journalists in Egypt this week, the Prime Minister had fine words to say about how appalled he was, and the vital importance of a free Press to democracy. He should consider his reaction to the hacking scandal, and hang his head. 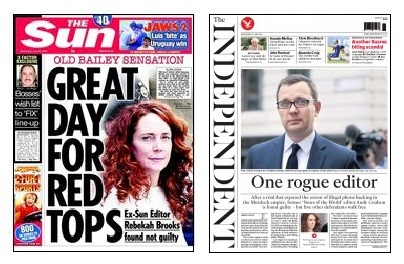 Which was the better angle, Brooks acquittal or Coulson conviction? Far from making it obvious that Parliament needed to get involved, Coulson's conviction and the guilty pleas of the five men who will be sentenced with him demonstrated the opposite. The scandal was uncovered by journalism, the police belatedly investigated and the courts delivered justice. The existing law of the land worked.